Beko make washing machines you can rely on and each Beko washing machine is designed to minimize the effort you need to put in when it comes to laundry. They feature advanced technology and are fully programmable to allow you to get the most out of every spin. Beko washing machines feature handy short cycles that not only save you time, but also minimise the impact to the environment by using less water energy. If you have a large family, look out for a Beko washing machine with a higher load capacity, this will save you doing extra loads and save you even more time. Washing clothes regularly not only removes dirt, it can also remove allergens such as pet hair, bacteria and pollen, which is ideal if someone in your family has allergies or suffers from asthma. The BEKO WX842430W Washing Machine is endorsed by Allergy UK and features a time delay function that allows you to program the machine to start at a convenient time up to 19 hours into the future. 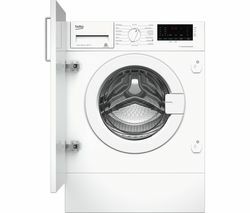 And with its large front loading porthole you won’t have any trouble getting your washing in and out. A Beko washing machine can save you time and take the chore out of laundry day. Check out more Beko laundry appliances such as Beko washer dryers at Currys.